If you’re thinking you’re the only one on Planet Earth fighting the dark spots or any other kind of hyperpigmentation problem, you may want to think twice. Hyperpigmentation is quite a common skin condition which is why there are so many options and ways to get rid of it. What are good soaps made of? The first thing to decide which soap to get for removing the dark spots, you need to make up your mind if you’re going to get a natural soap or one with chemical ingredients in it. If you’re sitting on the fence and have a hard time deciding, look for the soaps that are based both on chemical and natural ingredients. Look for the soaps that are based on turmeric, papaya or even carrot. They’re great for whitening the dark spots, leaving your skin nice and the skin tone even. Glycolic acid, salicylic acid or hyaluronic acid are some of the chemicals that remove dark spots, brightening the skin. There are also plenty of minerals and essential oils that may whiten the skin or able to remove the dead skin cells, leaving the skin fairer and lighter. Vitamin B, E, C or the jojoba and argan oil are some of the names that work their magic on skin. Skin reacts differently so you need to have that in mind when shopping. Don’t expect for the soap to be amazing after the first night, but do continue using it until you notice improvements. Last thing to check is the price tag, but you may start with it instead, if your money is short. 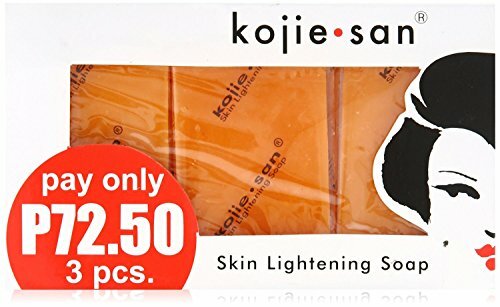 1.One of the most popular choices out there, the Kojie San Lightening Soap isn’t just low-priced, but also very efficient. In order to understand its popularity, you’re going to need to take a look at its list of ingredients. The main ingredient is kojic acid which many of us know it whitens skin, removing the dark spots. When you put it together with the coconut oil though, its efficiency gets even more impressive as it gets easier absorbed. Additionally, the coconut oil is also moisturizing the skin so you cover two main skin problems with just one soap. Some noticed right away how the soap was able to fade out age spots, dark spots, sun spots and even freckles. If you’re dealing also with scars and red marks, the soap is also a valid choice for you. We also like the soap as it’s 100% authentic and wears quite a nice scent. Even though it has a strong formula, you may confidently use it on many areas of your body and face, even twice a day. The soap may be a bit drying for some, which is why it should be followed by a moisturizer and sunscreen. You may want to run a patch test if your skin is sensitive. 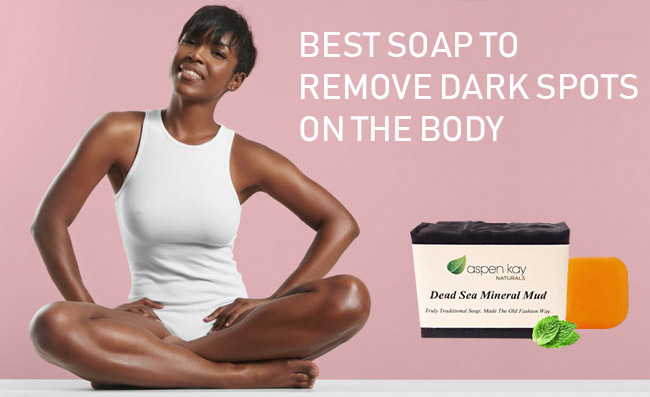 The soap stands out as a great choice for the African-American skin. It lathers and cleanses well, giving no break outs most of the time. In order to get the best out of it, you need to let it sit for 30 seconds or so. Look carefully at your skin reaction and don’t use it twice a day if it’s drying your skin. However, as it’s 100% authentic and efficient, you should try it the very next time you’re in need. 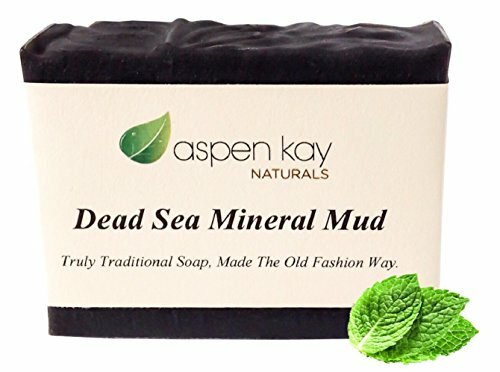 2.Even though it’s not made especially for removing the dark spots, the Dead Sea Mud Soap Bar 100% Organic & Natural brings many benefits for the skin, whitening of dark spots included. As a matter of fact, the numerous benefits explain the popularity of the soap. The soap is made with 100% pure Dead Sea mineral mud from Israel and it’s an organic product. It contains no chemicals or preservatives. Each bar is handmade by artisan soap maker. On top of everything else, the soap is vegan and cruelty-free. The formula of the soap includes only certified organic skin oils: shea butter, palm oil, castor bean oil, organic sunflower oil and extra virgin olive oil. We also notice on the list the therapeutic grade essential oils of peppermint, eucalyptus and lemongrass. All of these organic ingredients and natural ingredients recommend the soap for use on all skin types. It may be used by women, men and teens, as face soap, body soap and shaving soap as well. It works in case of psoriasis, acne and eczema too. Don’t worry about its dark grey color (almost black) as it’s caused by the Dead Sea mud and charcoal within the formula. The fine grains within the soap are going to exfoliate, getting your skin rid of the dead skin cells and giving it a nice glow. The soap tightens the pores and helps your skin look younger. It moisturizes and hydrates your skin, minimizing the looks of the fine lines and wrinkles too. The soap has a lovely smell and lasts for a good amount of time. It’s made through a cold process so everything about it it’s natural. As it brings so many good things to the table, not only the whitening of dark spots of various causes, the soap is one solid option when you care enough about the health of your skin. 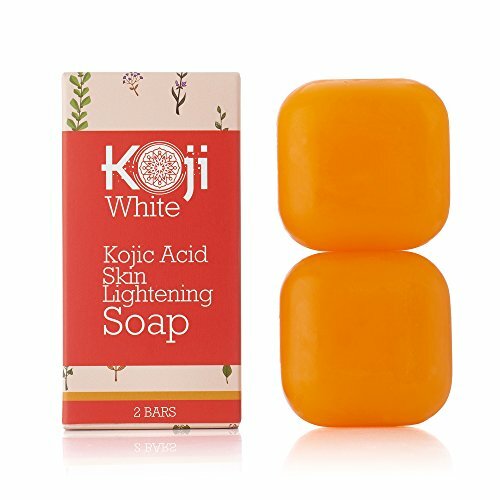 3.If you’re dealing with stretch marks, freckles or other dark spots, give it a go with the Pure Kojic Acid Skin Lightening Soap (2.82 oz. / 2 Bars) – Naturally Whitening for Tone Adjustment & Bleaching Skin. The soap is made with Koji white acid that whitens the skin, removing dark spots and evening your skin tone too. Not only the soap whitens the skin, but is also moisturizes it as its formula also includes coconut oil. The ingredients within the soap gets deeply into your skin, nourishing and hydrating the skin cells. As it’s 100% all natural, the soap is safe to use daily, no matter your skin type. It has a pretty smell and leaves a nice soft touch feel. Some feel it a bit drying so they follow it with a moisturizer. The soap lathers and cleanses very well. You may use it on your face and body too. it leaves your skin squeaky clean and the skin tone even. Let’s not forget to mention the soap comes very nice packaged, in a pretty box so it may be used as a thoughtful and economic gift too. Removing dark spots and smelling nice, the soap is a great choice for many. No matter the downsides, for the removal of dark spots and the natural formula, the soap is worth to try when in need. 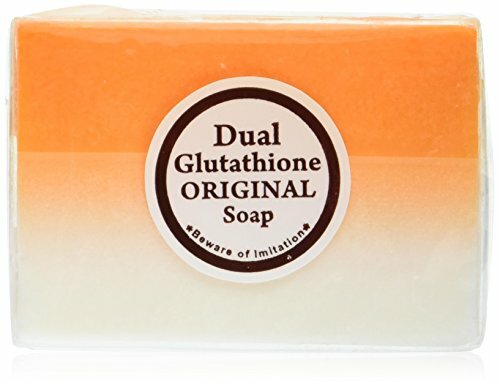 4.The 5 Bars Kojic Acid & Glutathione Dual Whitening/bleaching Soap may not be the best choice for the sensitive skin, but they’re a valid option for other skin types. The soap is based on a combination of extracts that have a micro-exfoliation effect and nourish the skin at the same time. Due to the formula, the soap is going to cleanse deeply dirt, removing even black/white heads. The soap is strong enough to lighten skin pigmentation and removes age spots, acne scars from inner thighs, underarms and even in intimate areas. When used right, the soap isn’t expected to cause peeling for more than a week. The soap is made through a cold process method so it holds all the valuable ingredients. Many feel the soap has no smell, but its smell is quite subtle in fact. The soap lathers gently and leaves your skin soft and nice. It’s better to start with 30 second application and gradually grow from that to 3 minutes, if your skin takes it well. Try not to rub it, but tab it. Rinse well when you’re done. The skin gets smoother, younger looking and the dark spots are fading out. The soap is a bit bigger than normal size soap, but it’s still easy to use. Regardless of the minor issues, the soap is still an efficient option for many. 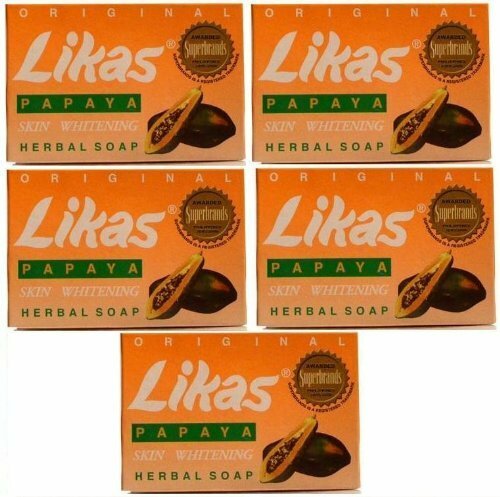 5.Leaving the skin not only squeaky clean, but also smooth and pretty, the Original Likas Papaya Skin Whitening Herbal Soap is a choice to consider for many reasons. Based mainly on papaya, the soap is rather strong so you need to be careful when using it. It’s able to fade out black spots from all over the body and even the red blemishes or scars. The soap works fine and may remove pimples as well. It leaves a nice glow on your skin and has rejuvenating abilities as well. The skin feels fresh and the smell is nice, not lingering for long time on your skin. The soap doesn’t dissolve fast so you may use it for quite some time. You get a pack of 5 bars so you’re covered for a long time. Even though it doesn’t work amazing on a dark skin, it may whiten dark spots from fairer skin tones. All things considered, the soap is able to get you rid of the dark spots and leaves your skin smooth and rejuvenated, which may be enough for many.